I am in the midst of remodeling a bathroom and have removed all the previous flooring and am down to the joists. I am putting down 3/4 plywood, cement board and then 1" hexagon tile. I'm having issues with the old toilet flange. Here at my house we went through great lengths to choose a skirted toilet and matching sink. I measured the center of the flange and it was 11.25. I thought this would allow me to still squeeze a 12" rough-in toilet into the existing space. But after a plumber gave us an estimate he said we had to use a toilet with a 10" rough-in. Another plumber said that we needed a 4x3 offset spigot flange. He can't seem to find one and I'm combing the net going slightly mad as I'm having no luck. The plumber and I are working with one another via phone and text at this point. I messaged him with this image since I can see it is a 4x3 offset flange. But it's not an offset "spigot" flange. He is saying by this image below that the bottom hub is too big. Am I to understand that a spigot flange has no hub that adds thickness to the bottom? The tubular piece is the same diameter from top to bottom? For the existing flange, I have to carefully cut away at the old flared portion of it which will allow me to get rid of the old metal ring. It appears to be a 3x4 flange, the opposite size openings for my needs. I was told to carefully grind away the inside that has been permanently bonded so that I can install a 4x3. I don't understand why I can't use this offset flange that I found online in the image above. 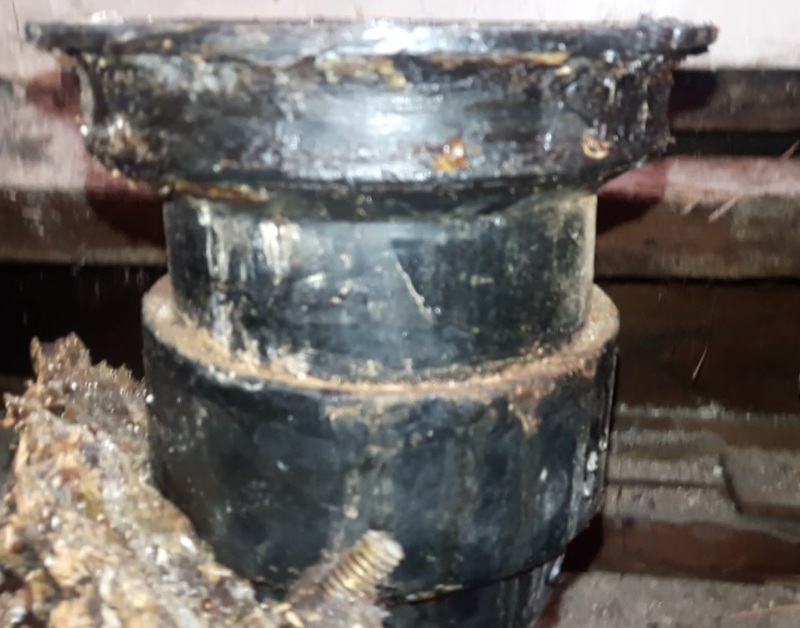 Here is the old current flange. I showed him the 4x3 offset flange and he said that due to the hub at the bottom that it won't fit. I don't have it in front of me. I'd have to order this online but isn't the total diameter of this 4x3 as in "three" total inches including the larger bottom hub? So I'm guessing a spigot flange is one without a hub? I can't seem to find a 4x3 offset spigot flange anywhere. He's trying to suggest that I go with a toilet that has a 10" rough-in because there are spigot flanges that will fit right in the existing position (after we cut away and grind the existing ABS in the floor to make it fit). The last thing I should probably mention as it might be important is that since I removed two layers of fir planking and three prior linoleum flooring, each with their own thin plywood backing, the floor is now lower than before. The flange is too high so I will have to shorten it as I cut it by approximately an inch, give or take. So this also starts to lessen the amount of leg room that I have to work with. Just thought I would mention this since it's part of the issue I'm dealing with. Suggestions, solutions or a miracle would be greatly appreciated! 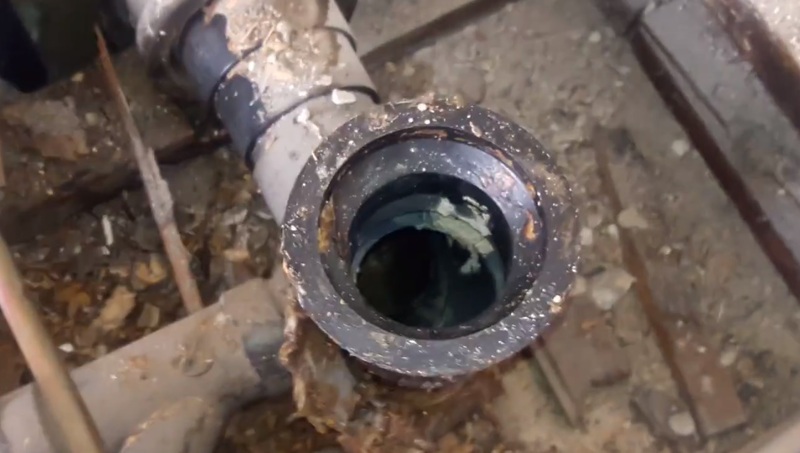 Am I to understand that a spigot flange has no hub that adds thickness to the bottom? Yes, the "hub" is designed to fit over a standard size pipe, a spigot fitting is designed to fit into a standard size pipe hub or fitting. Nothing is designed to fit into a pipe. why... can't I use this offset flange that I found? 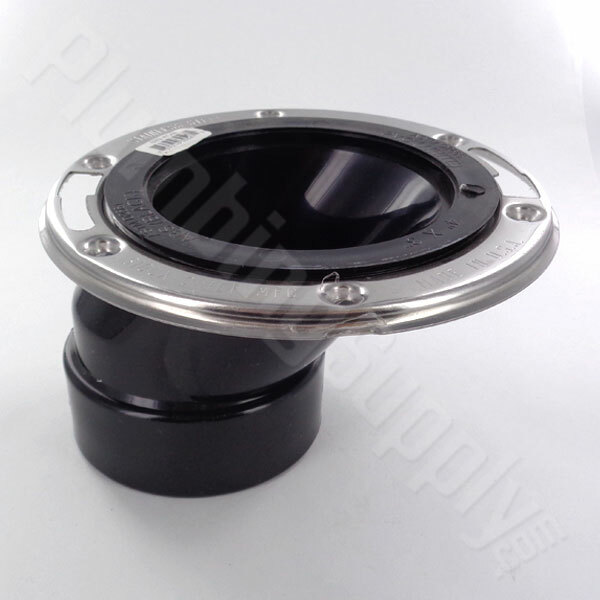 You can, that flange can be easily made into a "spigot" fitting by gluing a small piece of 3" pipe into it's hub end. Your new higher finished floor height should accommodate doing that. However... this simple fix would have been readily apparant to a competent plumber, so I suspect there is more to the story. You need to post a side-view picture that shows the closet flange connection to the assembly below. Note: you are mistakenly thinking that size terminology is a reference to actual dimensions (it is, but not in the way you think). When a fitting is listed as "3 inch" or "4 inch" it means only that it is designed to work with 3" pipe/fittings or 4" pipe/fittings, it does not correlate to actual dimensions (the size designation is the nominal inside diameter of the actual pipe, nothing to do with fitting dimensions). I am assuming you have ABS drain pipe there? I would just cut the pipe so that you could add a coupler and the appropriate length to get you to the 12" center R.I. then use a standard closet ring flange. Make sure you build your sub-floor up properly for the tile, this could also alter the floor height and change your ring height. Tile installed over wood floor systems should have a minimum of 1-1/4 inches of solid material beneath it. This means you can have a 3/4 inch wood subfloor covered by 1/2 inch plywood, cement board, or approved gypsum fiber underlayment. Add your tile to that with the thinset material in the 2 layers and you might be up to 1-1/2 inches or higher depending on your tile used. Not the answer you're looking for? Browse other questions tagged toilet flange or ask your own question. Would it work if I glued a new closet flange to an existing closet flange? What can replace this PVC toilet flange in iron pipe? Does a toilet have to be level front to back if the toilet doesn't rock and the flange tilts too? How is a toilet flange attached to new flooring? How can I extend an offset toilet flange when tiling? Is there a problem with this toilet flange or flange installation? Toilet flange issue. Any hope?